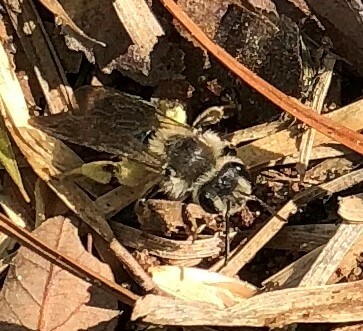 Digger bees resemble honey bees, although they do not sting, and would only bite if mistreated. Photo by Molly Jameson. 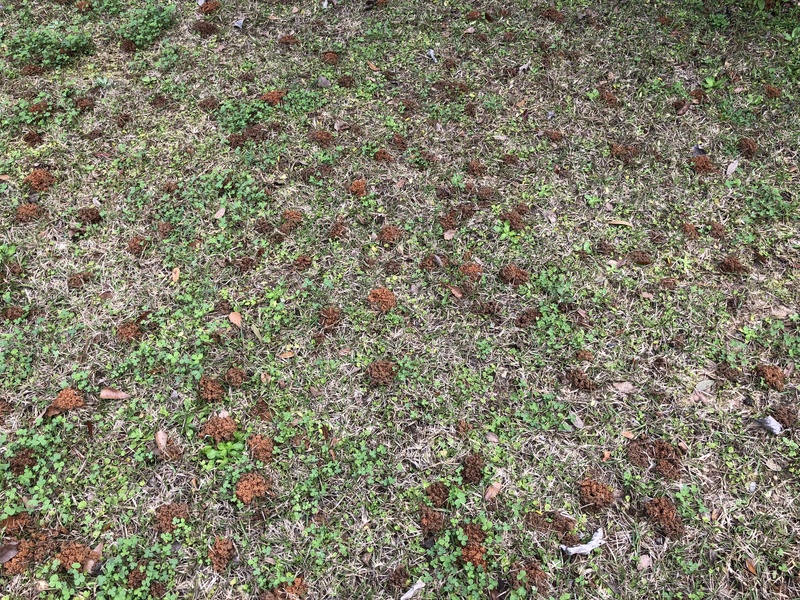 Have you noticed many little dirt piles that resemble mini ant mounds around your yard? Well, fear not, for these mini mounds are made by digger bees who are excellent, yet ephemeral, early-spring pollinators. These solitary ground-nesters are native to our area and only appear for four to six weeks to raise their offspring. Although they do not produce honey, they resemble honey bees in size and shape. They also do not sting and would only bite if they were handled roughly. Female digger bees build their nests close together, creating clusters of many small mounds. Photo by Molly Jameson. Otherwise known as miner bees, females create their underground cylinder-shaped nests in dry, well-drained soils, often right next to each other, creating patches of many mounds in a small area. These bees will pollinate many early-spring blooming flowers – a bonus for gardeners – as they collect pollen to add to each cell that they excavate. They then lay their eggs on these pollen masses, cap the cells with clay, and complete their life cycles. The eggs hatch about five days later and emerge from the chamber created by their mothers. 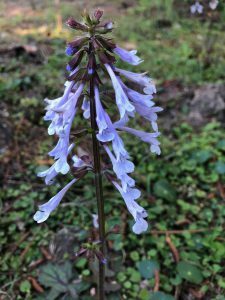 While digger bee mounds may detract from an otherwise tidy lawn, they will do no harm, and can actually be beneficial, in that they improve air, water, and nutrient percolation. If you feel you must discourage their presence, simply run a sprinkler over the area as their season approaches. They prefer dry soil rather than wet soil and will look elsewhere to build their nests. But better yet, take a seat on your front or back porch, pour yourself some lemonade, and take in the soothing hums of their wings as they do their work. Ah, the oft-ignored pine tree. 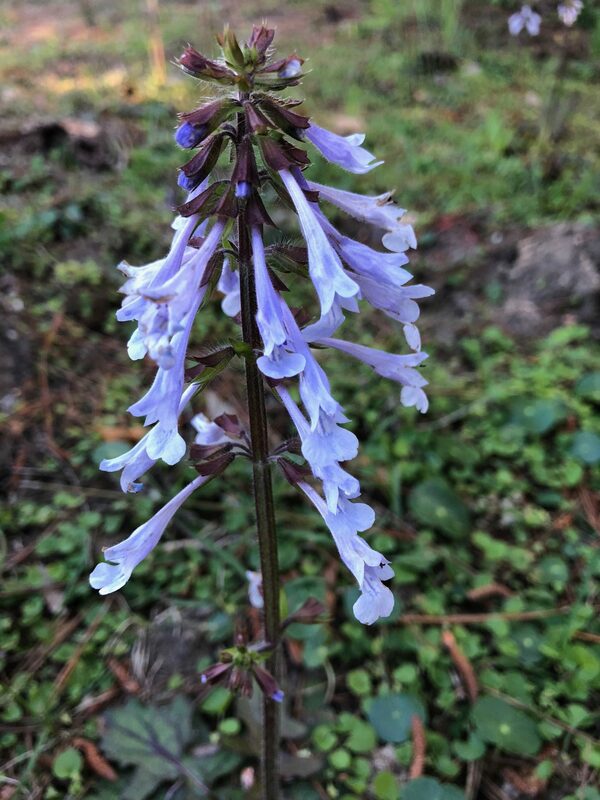 They are so ubiquitous throughout the southeast, that many people consider them undesirable in a landscape. Having grown up near the “Pine Belt” of Mississippi, I figured I knew plenty about them, but this week I learned something new. 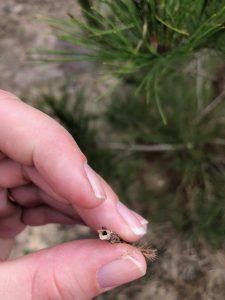 While on a field tour with local foresters in the business of loblolly and longleaf pine farming, they introduced me to the pine tip moth. 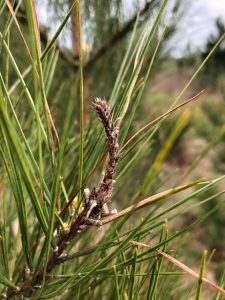 These insects can wreak havoc on valuable young pine trees. Female pine tip moths lay eggs on the growing end of a pine branch—particularly young, healthy loblolly and shortleaf (longleaf is rarely affected). When the eggs hatch 5-30 days later, the larvae start feeding. They tunnel into the shoot and bud of the pines, feeding on the tissue and burrowing a hollow cavity for several weeks. The larvae then pupate inside the space until becoming adult moths, exiting from the hole they created. The cycle restarts, with more adult moths, eggs and larvae. Adult Nantucket pine tip moth Rhyacionia frustrana (Comstock). Photograph by James A. Richmond, USDA Forest Service, www.Forestryimages.org. Two insect species are most common in our area; the subtropical pine tip moth (Rhyacionia subtropica) and Nantucket pine tip moth (Rhyacionia frustrana). 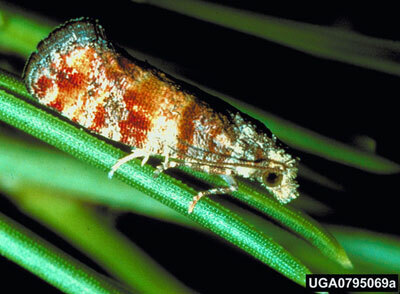 The moths are reddish copper in color, small (1/2” wingspan and 1/4” body length) and active at night. Caterpillar larvae have black heads and start out with off-white bodies, but change in color to brown and orange as they age. While this insect activity typically does not kill the tree, it does cause some die-off of terminal needles and branches. In extreme cases, it can cause tree death. Moths prefer younger trees and rarely affect pines taller than 15 feet. 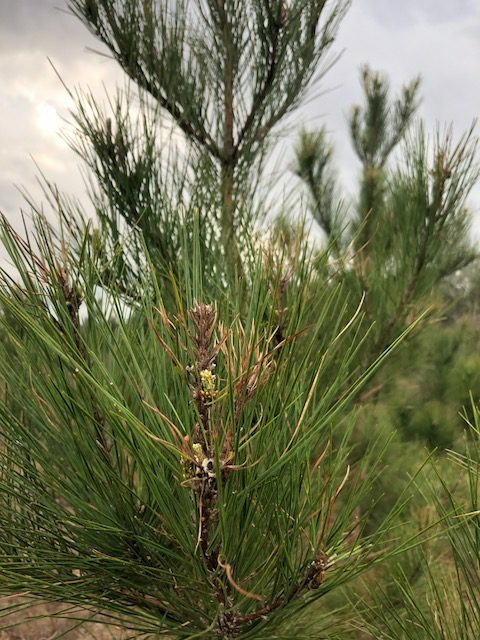 If you see a cluster of dead needles at the ends of young pine branches of your property, you can easily snap off the dead tip. You will likely find the hollow space formed by the larvae, which in spring may still contain the insect. 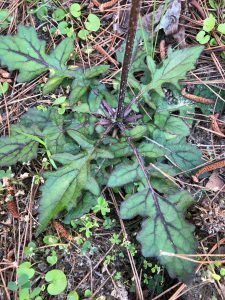 Treatment in a home landscape can managed by hand removal of infested shoots, but those in the commercial forestry business may need to install traps and consider insecticidal management. Visit the UF School of Forest Resources and Conservation website for more information. How many times have you pulled up to an intersection and couldn’t see oncoming traffic because a shrub was in the way? It’s frustrating, and unsafe. To help each other out, we should all pay attention to landscape plants that may be blocking the view of oncoming traffic and/or pedestrians, including your own driveway. Keeping a clear sight distance doesn’t mean you need a moonscape, but proper planning and maintenance of the landscape can look good and keep a clear sight distance. “Site distance” is what traffic engineers call being able to see driving lanes and sidewalks, in both directions. I knew engineers had such a term and assumed they would have a precise way to measure it. Of course, since they’re engineers, they did. A local traffic engineer with the Leon County Public Works Department sent me the sketch. The figure should help, but, basically, you need to think of it as a sight triangles. The three points in each triangle are 1) the driver’s location at an intersection stop (where triangles meet), 2) the centerline of each lane, and 3) a point 300 – 500 down each lane. To determine if the view is clear, stand where a driver would stop, and approximate the height of the driver’s eye. Please be safe as you rush to measure! I can’t see if anyone’s coming! Credit: Mark Tancig/UF IFAS. If you have vegetation in the way, assess the situation. 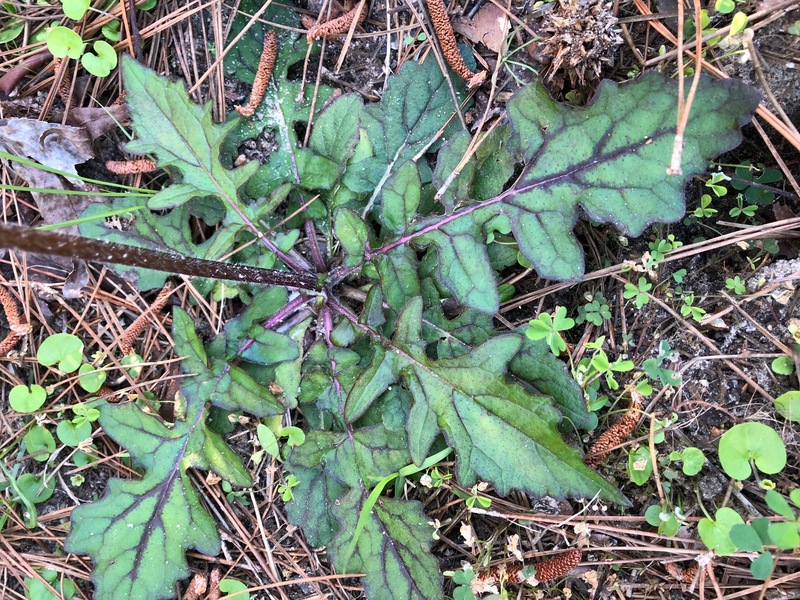 First thing to determine is what plant(s) you have. If you don’t know, send a photo to your local Extension Office. Next, determine if the identified plant(s) can be pruned to get out of view and/or below the height of the driver’s eye. Transplanting to another location is a possibility, if it’s a plant that transplants well and isn’t too large. Otherwise, removing and replacing is the best option for the safety of the community. There are many, many more plants to choose from, including dwarf varieties of common ornamental plants. Your local Extension Office can help provide resources to help you make a good choice. Online resources, such as the Florida-Friendly Landscaping Pattern Books and the Guide to Plant Selection and Landscape Design, are also available. The best time to treat for mole crickets is June through July, but don’t treat at all if mole crickets have not been positively found and identified in the affected lawn areas. We can take advantage of the fact that there’s only one generation per year in North Florida. The eggs will have all hatched by mid to late June. 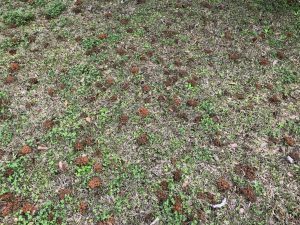 At that time, you’re dealing with young mole crickets that can’t fly and that are much more susceptible to the insecticides designed to kill them. Mole crickets spend winter as adults in the soil. In late February and March, adults emerge and begin mating. Shortly after mating, males die and females fly to suitable areas for egg laying. Mated females deposit eggs in tunnels. After depositing her eggs the female dies. Attempting to control adult mole crickets during this mating period a waste of time, money and product. Plus, adult mole crickets are difficult to control and can easily fly out of treated areas. 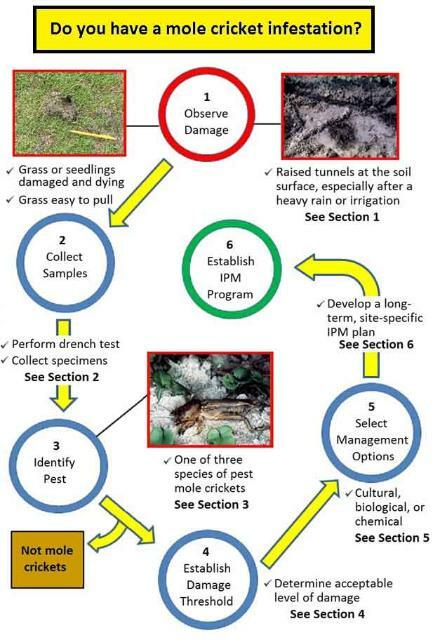 See this excellent graphic from the Mole Cricket IPM Guide for Florida. For more information on mole crickets, including recommended insecticides and other non-chemical control options, contact the UF/IFAS Extension Office in your County.